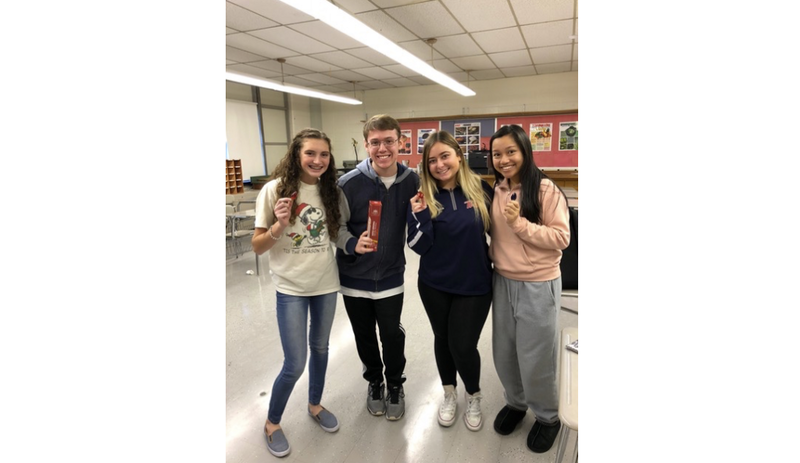 Washington Township junior class officers Jeanine Morrow, George Gerber, Talia Verrecchio and Anhtina Ho pose with window candle lights that were sold in the “Light Up Our Future” fundraiser. Missing from photo is Megan DeRuchie, who also assisted with the project that yielded $1,700 for six selected charities. All donors received an electric window candle kit that contained one electric candle light with automatic dusk/dawn, on/0ff light sensor, two clear bulbs, one suction cup candle clamp and one colored bulb to support the charity of the donor’s choice.